Janet Foxley & Steve Wells. Chicken House for Scholastic Australia. A Bug in a Book Review by Vicki Griffin. What an absolutely delightful book! The author has captured a whimsical feel along with touches of reality throughout. Muncle Trogg is from a family of giants except he is small and this poses a problem. He is constantly picked on and held upside down by his giant brother Gritt. They live on top of Mount Grumble (clever name) so the humans (smallings) can’t find them. The ‘smallings’ live below the mountain. Janet Foxley takes us on an amazing journey where things are not what they seem and then they are. Her use of descriptive text allows a genuine visualisation of the ugly giant’s warts, magic sticks and dragons. As for poor Muncle one can only sympathise with him for being so small amongst giants and not really understanding why he is small. The tale is filled with dragons, trap doors, dark forests and an adventure Muncle will never forget. On a chance meeting with ‘the wise man ‘to King Thortless ‘ named Biblos he gets to see’ smallings ‘clothing and they fit him. Biblos wisely suggests to Muncle that he dress in them for the upcoming King’s birthday party , a competition that is held for part of the celebrations but Muncle is scared that they will mistake him for a’ smalling’ and eat him! Muncle decides he wants to find out more about the smallings and sneaks off dressed as one into their town below where he meets a girl named Emily but he has to get back to the mountain and she needs to go to school. He is fascinated by their world and wants to find out what the words mean in a smalling book that Bilbo has given him by mistake. It turns out to be a recipe book but not the sort of recipes giants are used to. by the giants and given to the King’s daughter as a toy or to be eaten but Muncle has other plans and rescues her but not before the smalling and Giants come head to head with an inevitable war. A plan is devised by Muncle that saves the day and keeps their hiding place secret from the smallings. The King makes him the’ wise man’ and Muncle works out from what Emily had told him earlier that the giants are actually on a volcano not a mountain and that it could erupt! Muncle doesn’t really understand what a volcano is but he knows it is heating up and they could be in trouble. Throughout this exquisite tale Muncle is continually grabbed by his ankles and turned upside down due to his size, his brother Gritt is the main offender and this is where the tale ends. This book is funny and disgusting in a good way and full of illustrations that are placed strategically throughout. 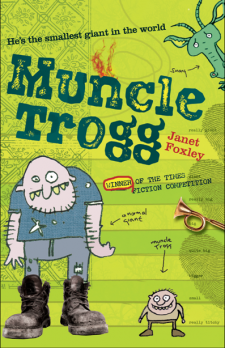 Muncle Trogg would suit middle age children and adults or anyone who loves fantasy and adventure. Muncle Trogg is a believable little character and no doubt the author found it hard to let him go alone in the forest which was filled with smallings that could harm him if caught. She has expertly woven issues like bullying and empathy throughout this funny story and it works. A great read! I would give it 5 stars and Muncle Trogg would be a wonderful addition for school libraries also. Categories: Children's Recommended Read, Junior Novel, Middle Grade • Tags: Janet Foxley, Reviewer - Vicki Griffin, Scholastic Aus, Steve Wells.